A side door, recessed side decks, an open cockpit sheltered by the flybridge, double doors and a large platform… nothing beats open-air living. True to the original concept, the flybridge offers three incomparable living spaces. 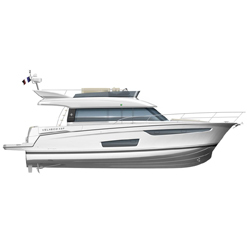 Down below, the VELASCO 37F has a very spacious owner’s cabin and an attractively proportioned double cabin. The head compartment includes a separate shower stall (WC outside the shower). She features all the hallmarks of a quality JEANNEAU interior.